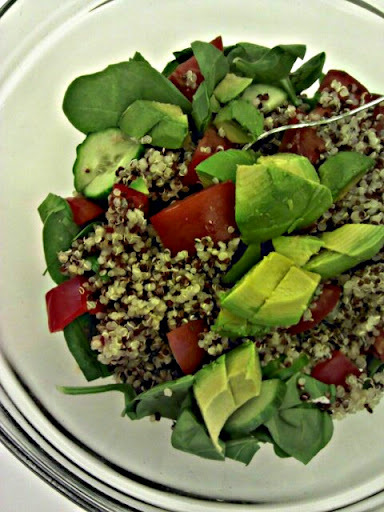 I grew up eating buckwheat. 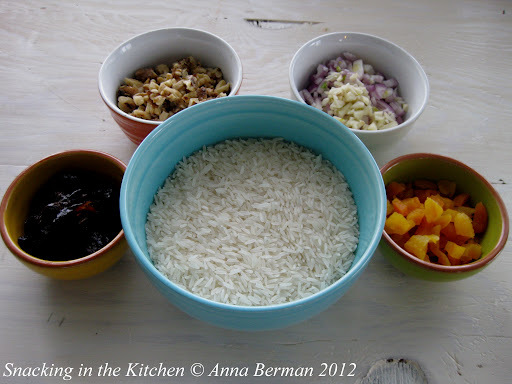 My family would have it for dinner as a side dish, cooking it very similarly to rice. Often, buckwheat would be mixed with a heaping spoon of sauteed onions and topped with a chopped boiled egg. There was probably a pickle on a side. 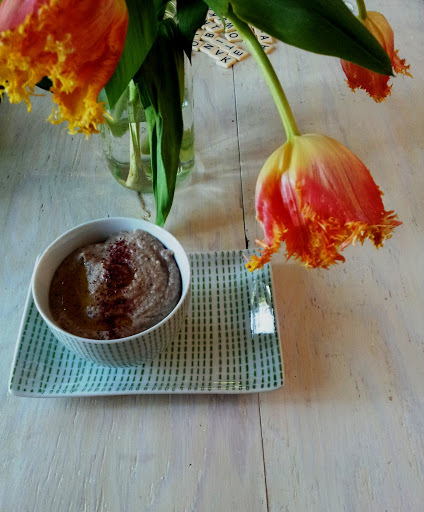 This time, I tried a different form of buckwheat – Bob’s Red Mill Organic Creamy Buckwheat Cereal. 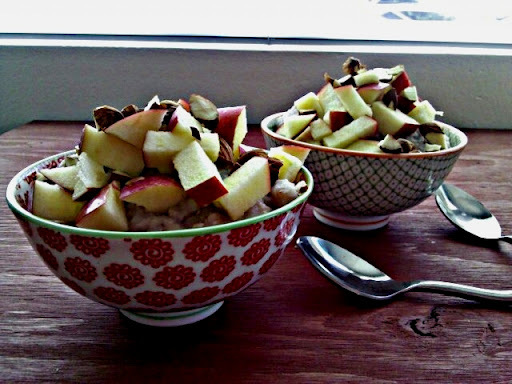 I had it for breakfast, naturally sweetened with chopped apples. Why buckwheat? 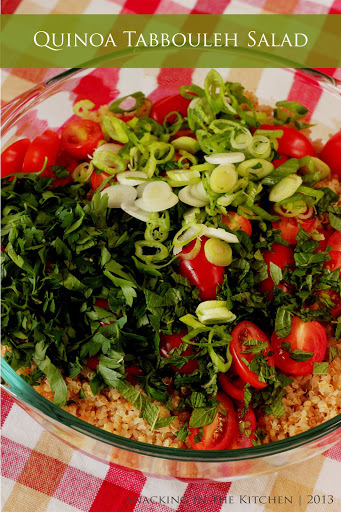 It’s a whole grain, gluten free, and a great source of protein and fiber. How else would you want to start your day? 1. Combine cereal, milk, and salt in a saucepan and bring to a boil over medium high heat. 2. 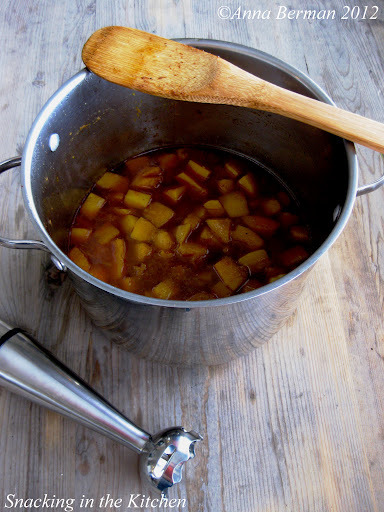 Reduce the heat to low, cover the saucepan and cook the cereal for about 10 minutes, stirring occasionally. If the cereal becomes too thick, whisk in a little bit more almond milk. 3. 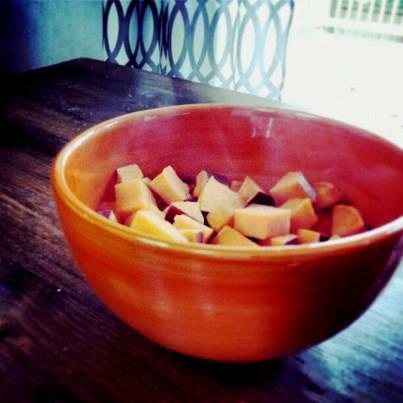 Arrange half of the apples at the bottom of two serving bowls. 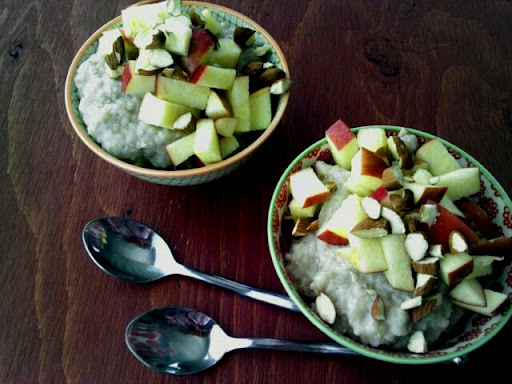 Spoon cooked cereal over the apples and garnish with the remaining apples and chopped almonds. This was definitely a filling breakfast. Had I not been on my cleanse, I would have added brown sugar and perhaps a touch of cream. I would have also toasted the almonds. 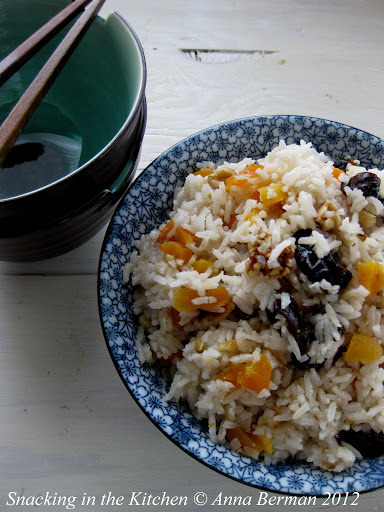 This would be lovely with dried cherries or apricots. Happy eating! The days of poached or scrambled eggs for breakfast are temporarily on hold, as I am entering the last five days of the Vegan and Gluten Free Detox. 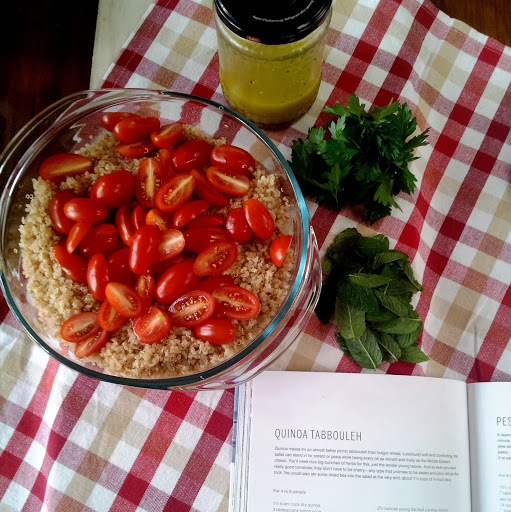 Instead of eggs, I have been eating quinoa with steamed kale. It tastes a lot better than it might sound, especially with a splash of olive oil, balsamic vinegar, and a dash of red pepper flakes. 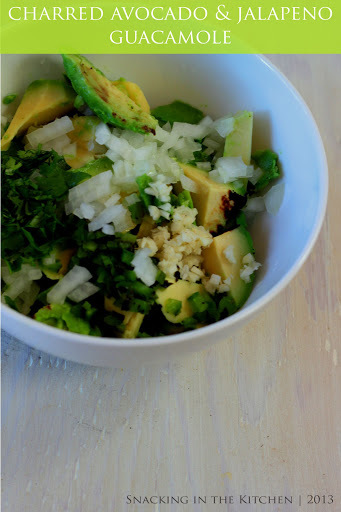 This morning I wanted something other than quinoa – cold, refreshing, and colorful. A little bit of chopping, some whisking, and stirring, and I served two plates of Chopped Salad with Tahini Lemon Dressing in just minutes. 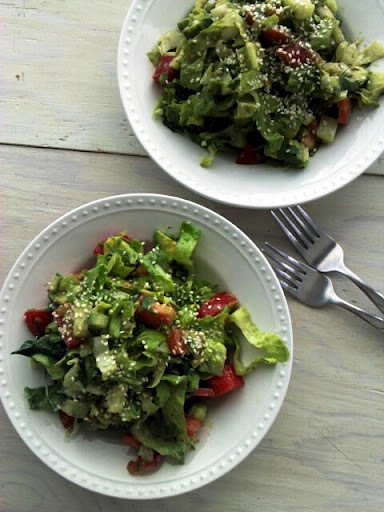 This couldn’t be quicker or easier, yet a perfect combination of crisp Romaine, chopped vegetables, creamy dressing and a final touch of sesame seeds. 1. 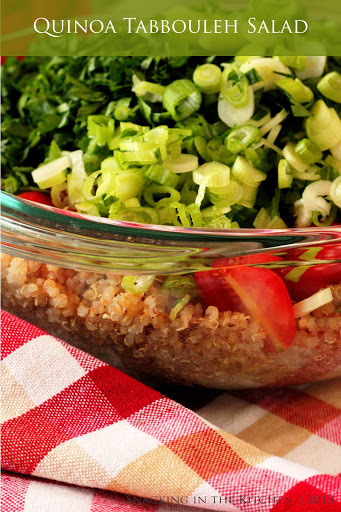 Combine together salad ingredients in a large salad bowl. 2. 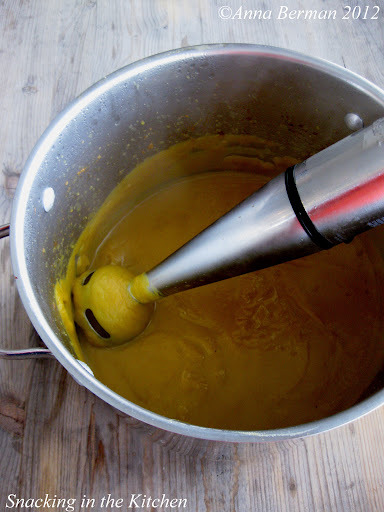 Whisk together the dressing. 3. 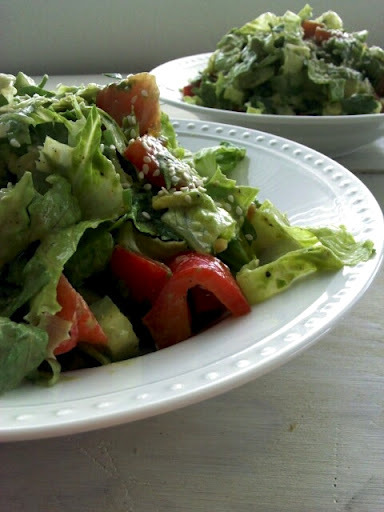 Gentle toss the salad with the dressing and season to taste. Garnish with sesame seeds. Oh boy! 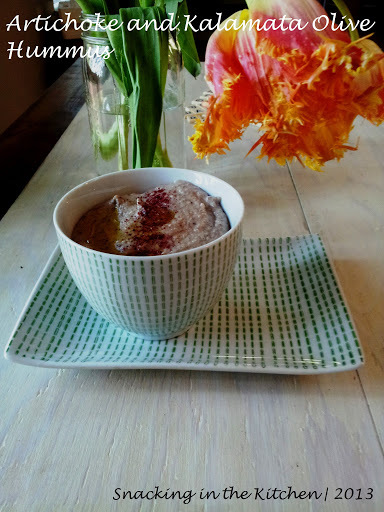 For the next eleven days I will be doing a cleansing eating plan – a combination of gluten-free and vegan, no caffeine, no alcohol, no chocolate! 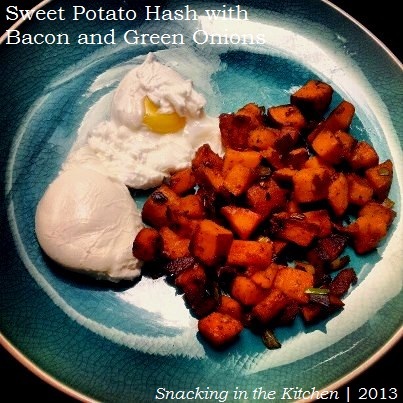 I will have to give in for 2 meals to make exceptions, but for the rest 31 meals plus snacks, I will stick to the plan. 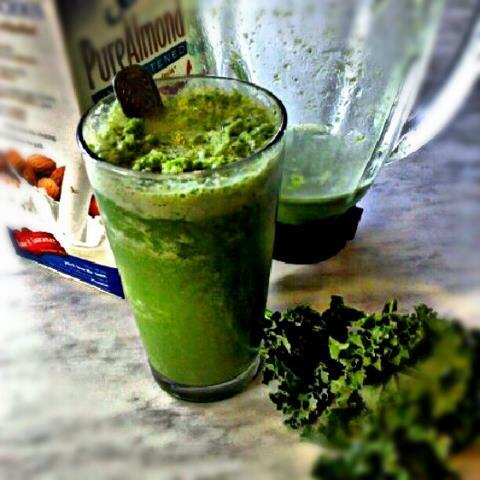 This morning, I started with a Clean Your Body SuperFood Shake: Kale, Almond Milk, Ice. Clean kale, and tear the leaves into small pieces. 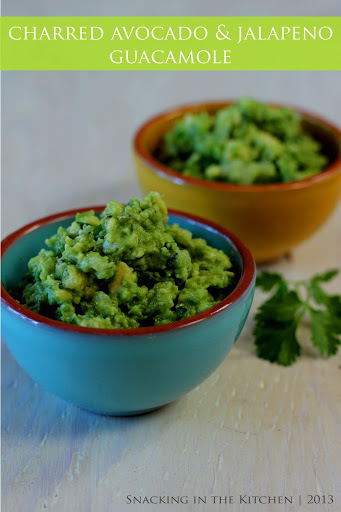 I used about a cup and half of this vitamin-packed green. 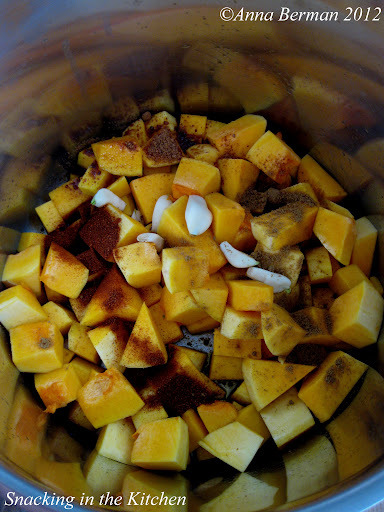 Place at the bottom of a blender (how I wish I had a Vitamix for this!). 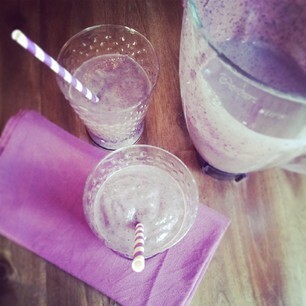 Add a cup of non-sweetened almond milk, and a cup of ice. Tightly secure on the lid for the blender and blend. 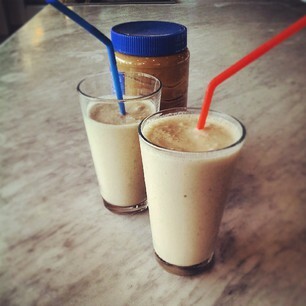 It’s a combination of a shake and an icee. I will try adding herbs and spices tomorrow, but for now, I’m off to slurping. I am trying to eat healthier these days. The word “healthier” means different things to many of us. 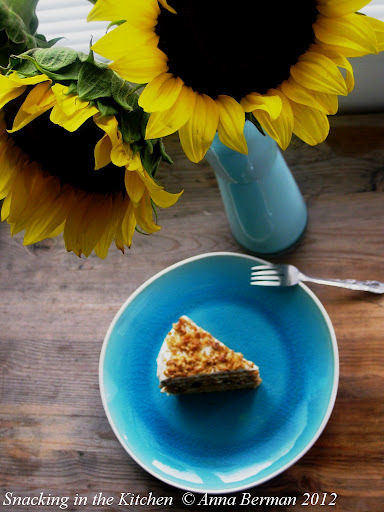 For me, I’m attempting to exercise control when it comes to portion size and cut down on processed sugar and carbohydrates (I actually turned down ice cream last night!). It’s also, finally summer in Seattle, so perhaps, the plates naturally get a lighter makeover. 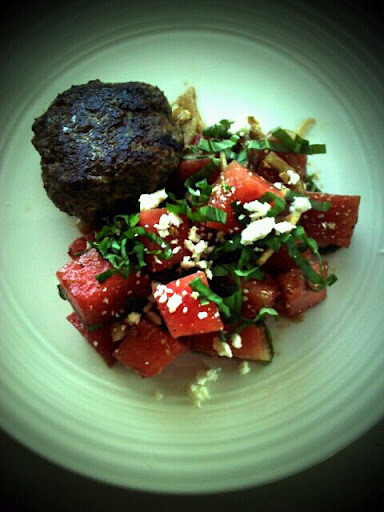 Last night for dinner I decided to make these Lamb Burgers with Pesto to go along with a Watermelon Salad with Feta, Basil and Balsamic Glaze (inspired by this similar watermelon salad). Dinner was a hit! The plates looked vibrant with jeweled cubes of watermelon, sprinkled with ribbons of basil and little morsels of feta cheese. 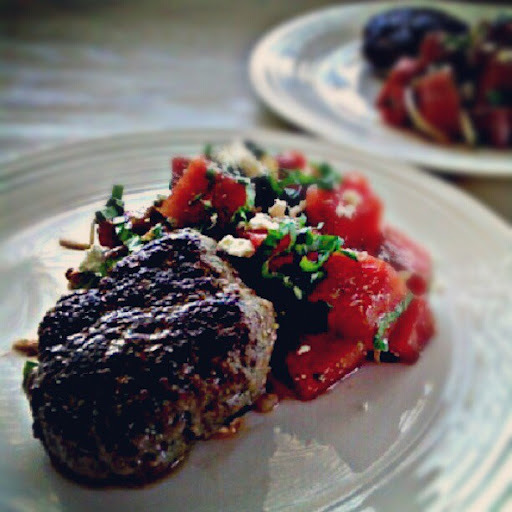 The lamb burgers turned out especially flavorful, most likely because of the fresh homemade pesto I used. 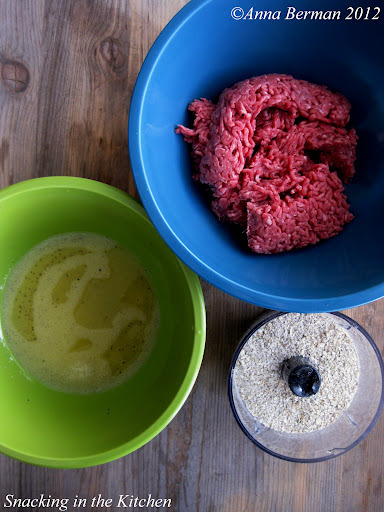 If you don’t have pesto on hand, feel free to add minced garlic, chopped basil and a touch of oil to the burger mix. 1. 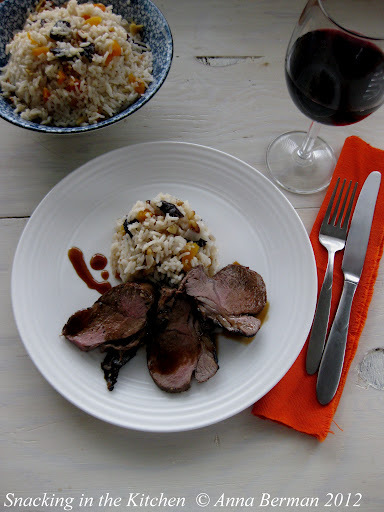 Combine lamb and spices in a bowl and mix thoroughly. Do not over mix or your burgers will come out very tough. 2. 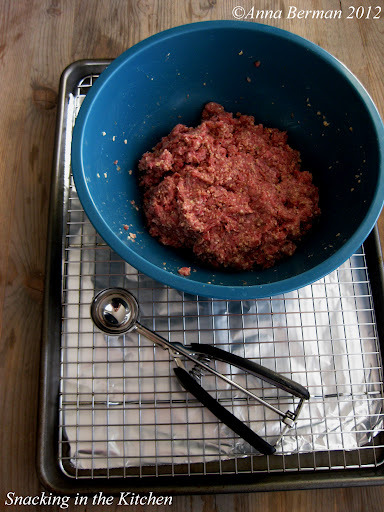 Shape the lamb mixture into 4 burger patties, about 1/2 inch thick. 3. 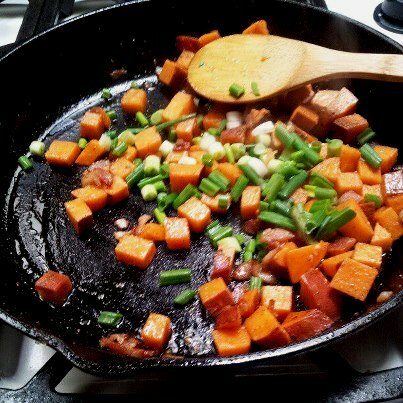 Lightly grease a nonstick pan or a griddle and heat over medium high. 4. Cook burgers 4-5 minutes on each side or to your own desired doneness. 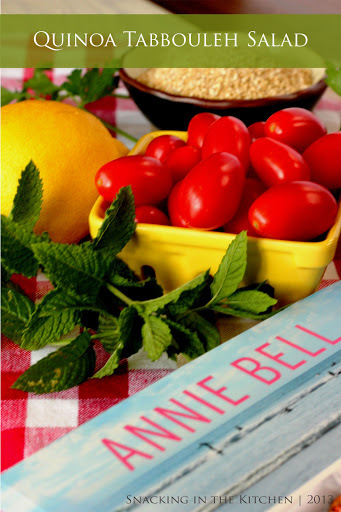 What are you serving these days to lighten up your summer meals? I was thrilled when I came home to a box of goodies from Muir Glen Organic. 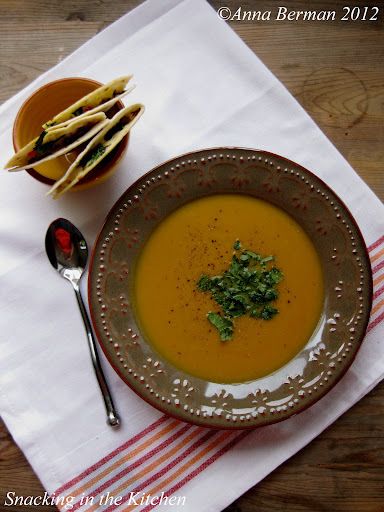 Over the next months I will feature recipes using items from the box as inspiration. 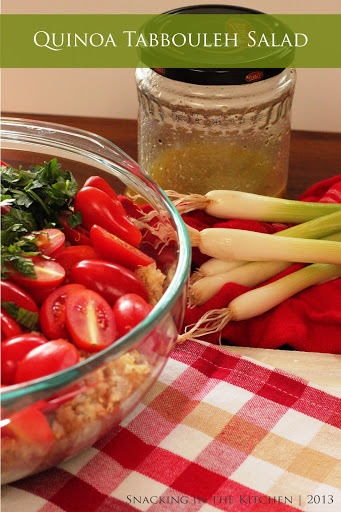 Today, I want to share a three-ingredient recipe with Red and Yellow Diced Tomatoes. 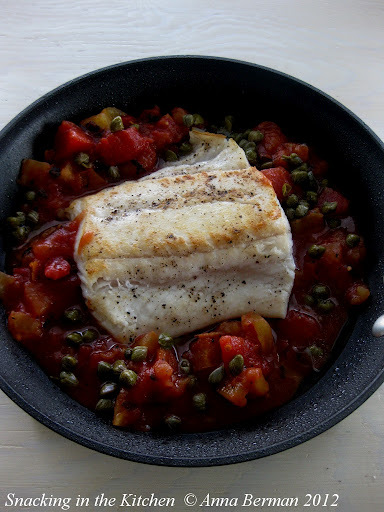 This recipe for Pan Seared Halibut, Braised in Diced Tomatoes with Capers took under 30 minutes to prepare and sang with bright notes of flavor. 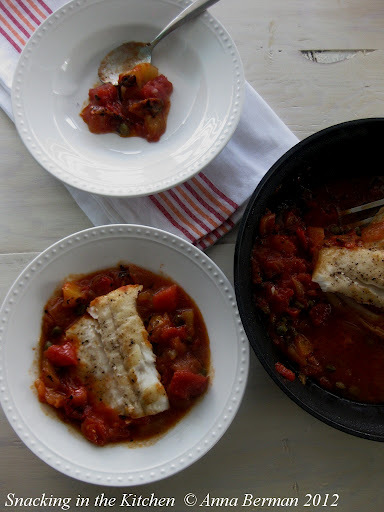 The halibut, one of my favorite fish, turned out perfectly tender after leisurely simmering in diced tomatoes. 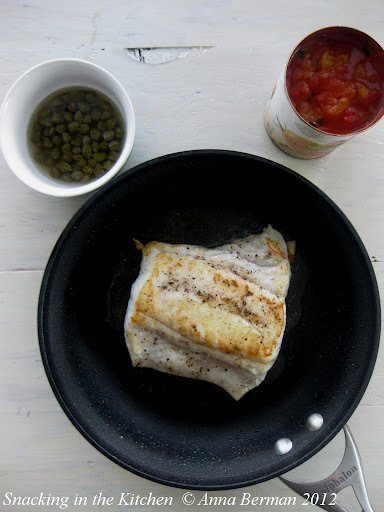 Salty, briny capers snuggled along the fish and imparted a vibrant, lemony taste. 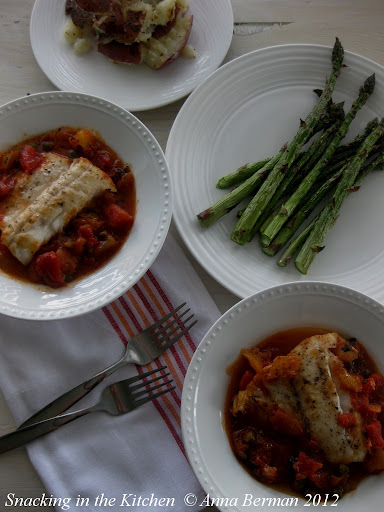 I served the fish along with Smashed Red Potatoes (recipe to come) and Simply Broiled Asparagus. 1. 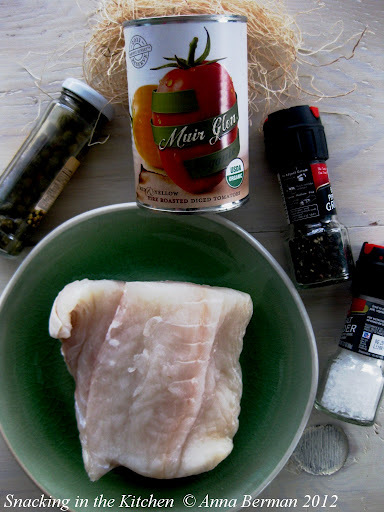 Season halibut with salt and pepper on both sides. 2. Heat oil in nonstick pan over medium high heat. Sear halibut, presentation side down, for 5 minutes. 3. 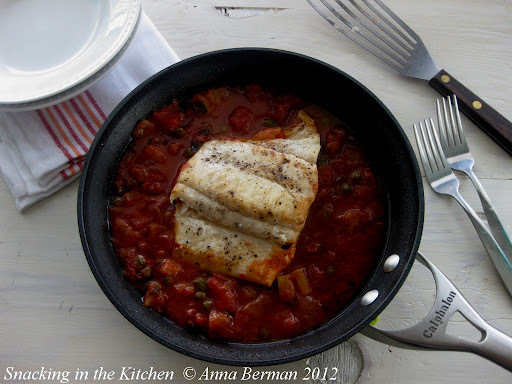 Flip the fish and add tomatoes and capers. 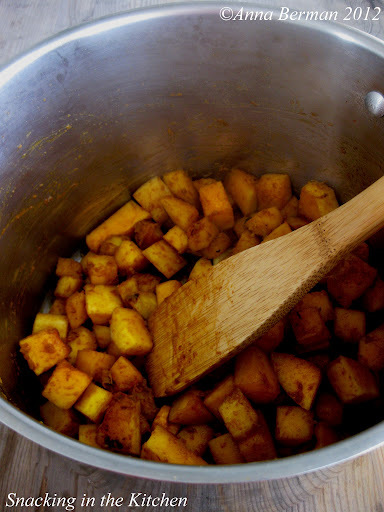 Lower the heat, tightly cover the pan and simmer for 15 minutes. 4. Season with additional salt and pepper, if needed. The fish is ready when it’s flaky, bright white, and springs back to the touch. 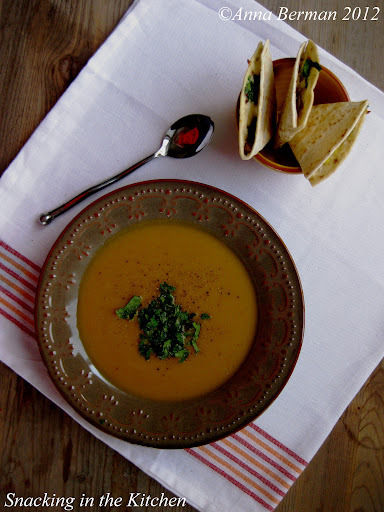 This was a surprisingly simple meal – after all, only three ingredients! 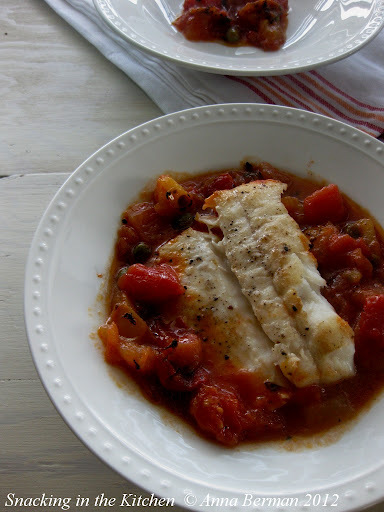 Try this recipe with your favorite fish. 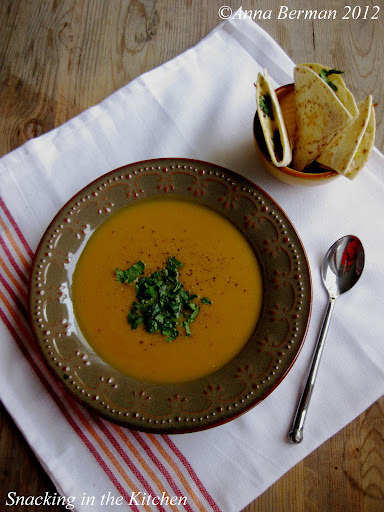 Serve with smashed potatoes and asparagus, as pictured below, or pieces of crusty bread to soak up the tomato goodness. A few days earlier, I shared with you a slice of birthday cake. The sweet memories of the stacked honey cake layers still linger. But that sweetness had to wait until after dinner. What came before the cake was a culinary experience of sorts, and a test of boundaries for my family. 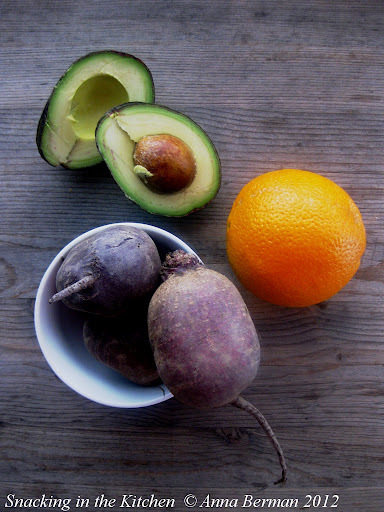 Would a group of somewhat conservative eaters (I’m primarily pointing fingers at my dad and my brother) appreciate a trinity of beets, oranges, and avocado? There was only one way to find out. As I spent several hours in my parents’ kitchen preparing a few salads for my birthday dinner, I came across three beets at the bottom drawer of their refrigerator. I am pretty sure the beets were intended for a pot of borscht, but I had something else in mind for their final destination. 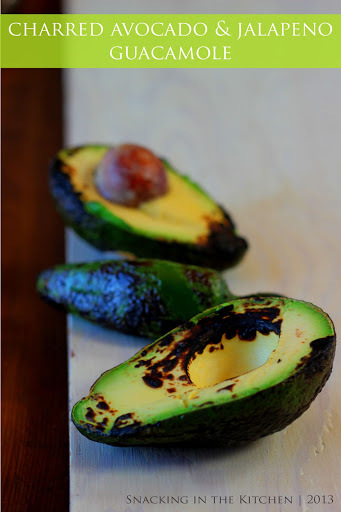 I decided to drizzle them with olive oil, generously season them with salt and pepper, and roast them in a hot oven. Oranges and avocado joined the party and offered a glorious array of colors. 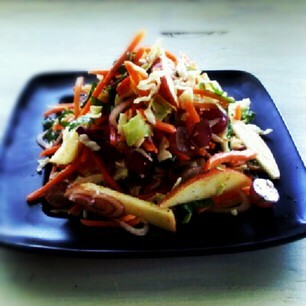 Let me tell you, the salad got high scores and was approved by every picky eater. 2. 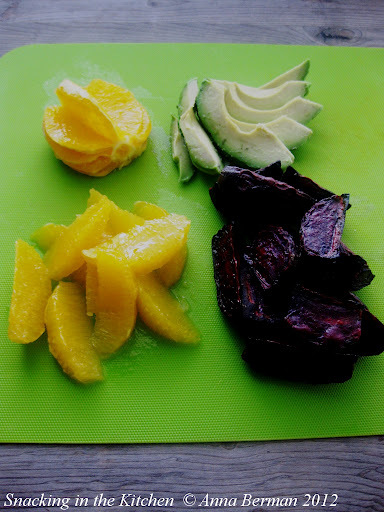 Scrub the beets, trim off the ends and stems, and cut the beet into six wedges. 3. 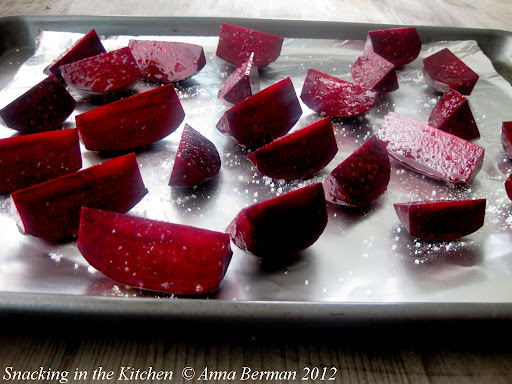 Place beets on a foil-lined baking sheet. Drizzle with olive oil and season with salt and pepper. 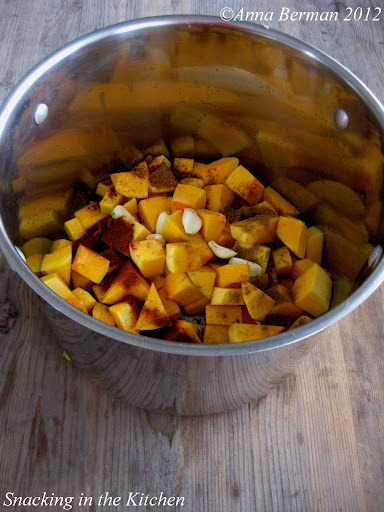 Roast for 35-45 minutes or until tender. 4. 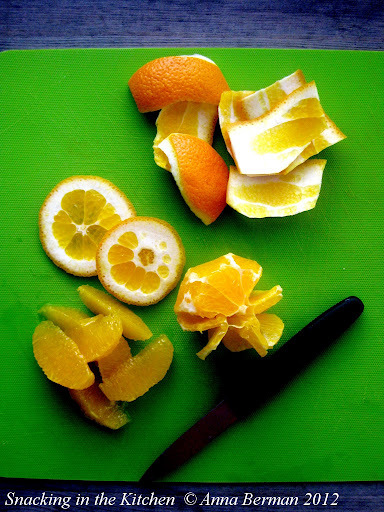 Supreme (segment) oranges, reserving orange juice for the dressing. 5. Arrange cooled beets on a platter in a circular shape. 6. 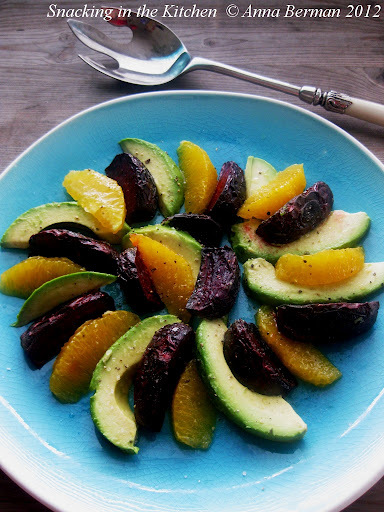 Slice avocado and arrange between wedges of beets, alternating with orange supremes. 7. 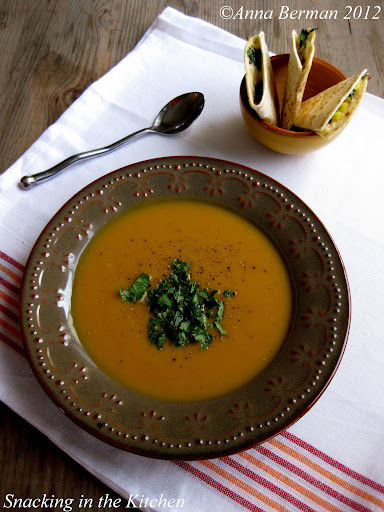 Drizzle the salad with orange juice and olive oil, and season with salt and pepper. That’s it folks! If you feel super fancy, you might add nuts and cheese to the salad. 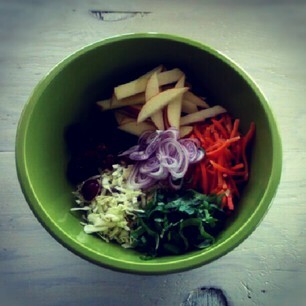 You can also arrange the salad on top of arugula or your favorite salad greens. 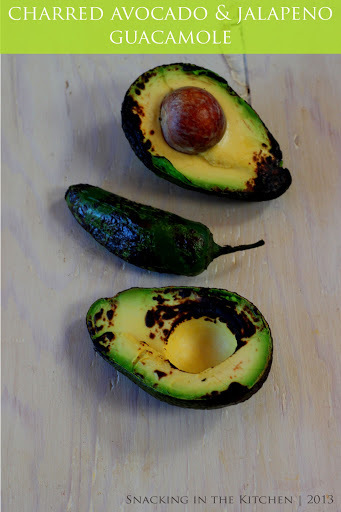 Why the salad works: the texture variation between the buttery, creamy avocado and the hearty beets offers a perfect mouthfeel in every bite. 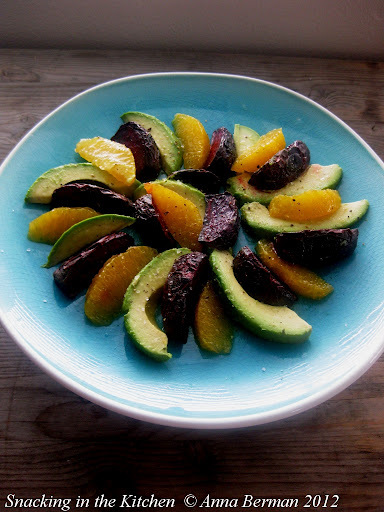 The sweetness of the oranges compliments the earthy sweetness of the beets, while the oranges’ acidity cuts the avocado’s richness nicely. 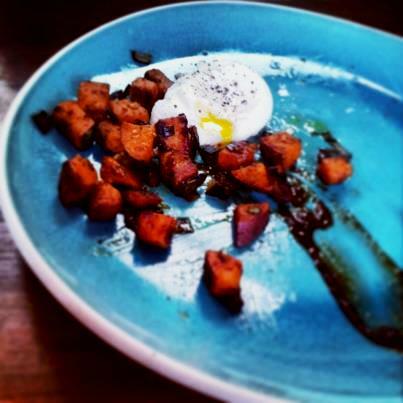 I love my friends, but let’s be honest – they are a bunch of picky eaters! Alright, some of them are picky. Others are perfectly happy to eat whatever, whenever, wherever. 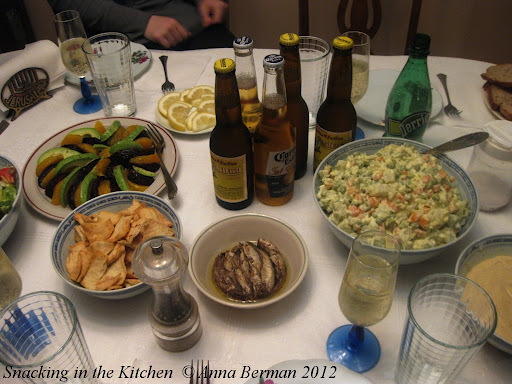 Project “You Buy, I Cook” is my way to share cooking and dining experiences with friends – picky and otherwise. 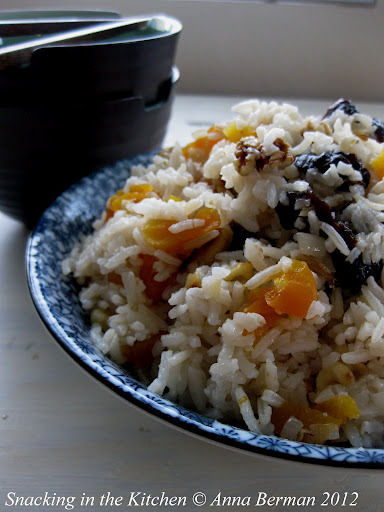 For the most part, I think the project challenges my friends to eat something new, try an exotic ingredient or discover an unusual flavor combination. For the latest “You Buy, I Cook” I was the one challenged! The challenge, posed by my friend Nadiya, was to develop a recipe for Gluten Free and Dairy Free meatballs. Extra challenge points: no onions, minimum use of spices, and obviously no cheese, milk or bread. Nadiya showed up with a pound of beef, some instant oatmeal, a few eggs, diced tomatoes, and tomato sauce. We rolled up our sleeves (and later meatballs) and went to work. 1. 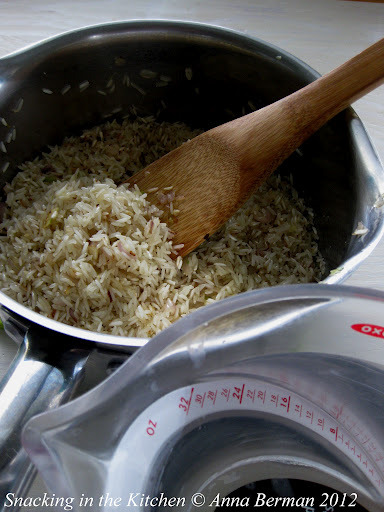 Combine oats, Italian seasoning, salt, pepper and garlic in a food processor. 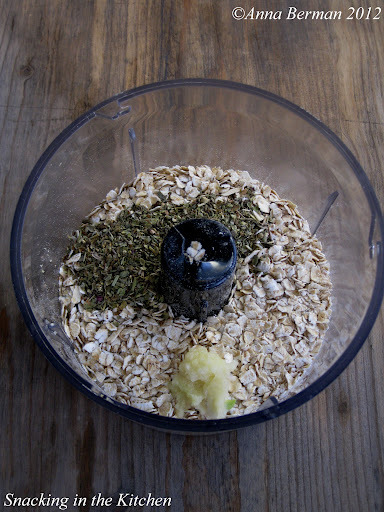 Pulse until oats are coarsely chopped. Set aside. 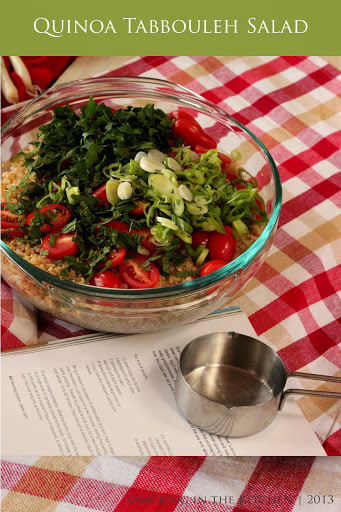 The oats are one of the binders in the recipe and keep your meat balls together. They also add lots of nutritional value! 2. 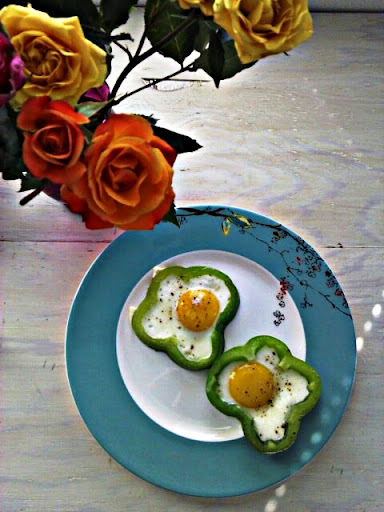 In a small bowl, whisk together eggs and water. If you don’t mind having some dairy in your diet, feel free to substitute water with milk. 3. 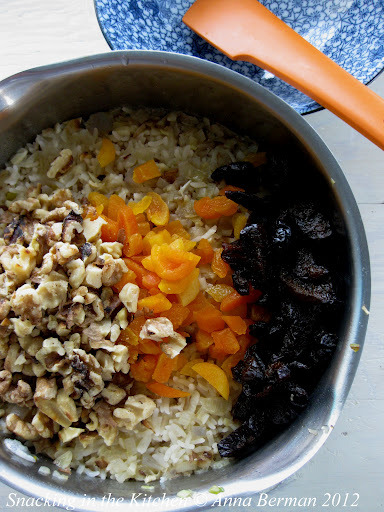 Gently stir the oatmeal mixture and eggs with the ground beef. 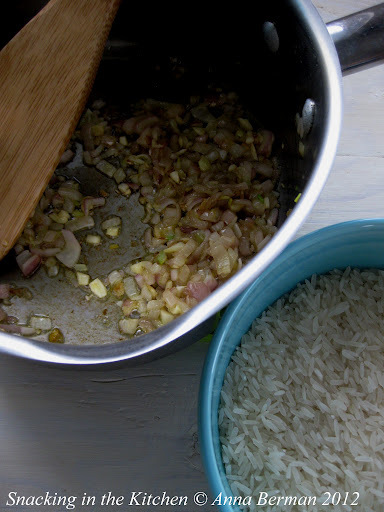 Mix enough to combine without overworking the beef. 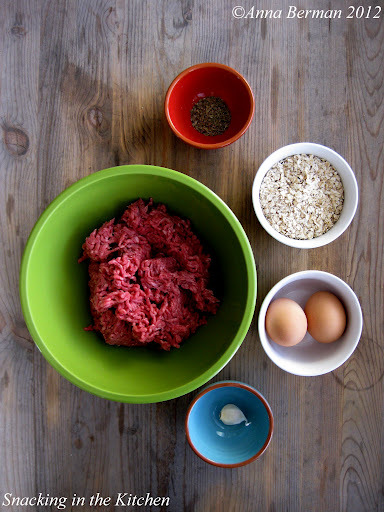 Overworking the beef will result in tough meatballs and who would want those? 4. Using a scoop, form meatballs (my medium size scoop allowed for 24 meatballs). 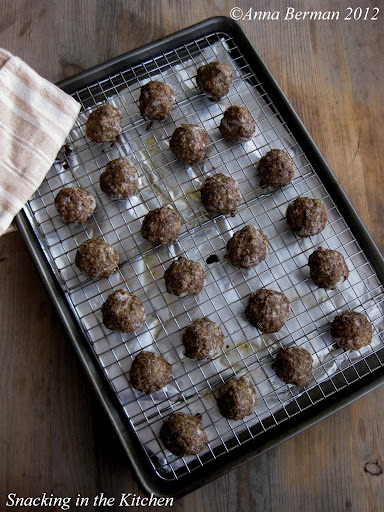 Place meatballs on a lightly greased cooling rack set inside an aluminum lined baking sheet. 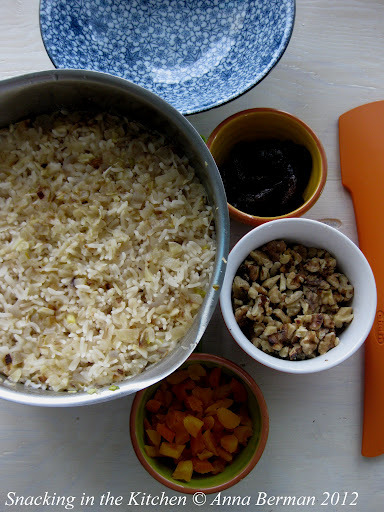 Refrigerate the meatballs for 30-60 minutes to allow the oatmeal to absorb the liquid and the meatballs to set. 5. 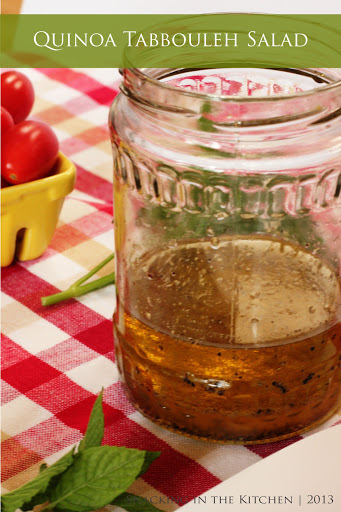 Meanwhile, make tomato sauce by sauteing canned tomatoes in olive oil along with Italian seasoning. Add a can of tomato sauce and sugar, and simmer on low until the meatballs are done. If it were up to me, I would start the sauce by sauteing onion and garlic, adding red pepper flakes and finishing up with freshly grated cheese. 6. Preheat oven to 375 degrees. 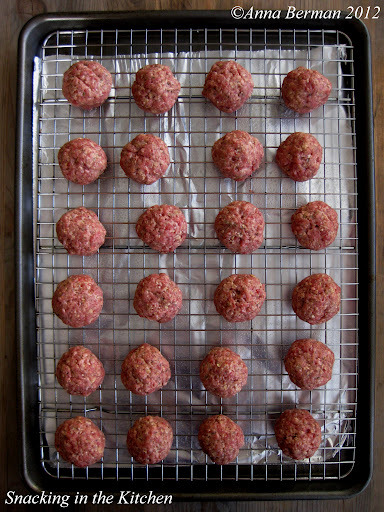 Remove meatballs from the refrigerator and bake for 30 minutes. 7. 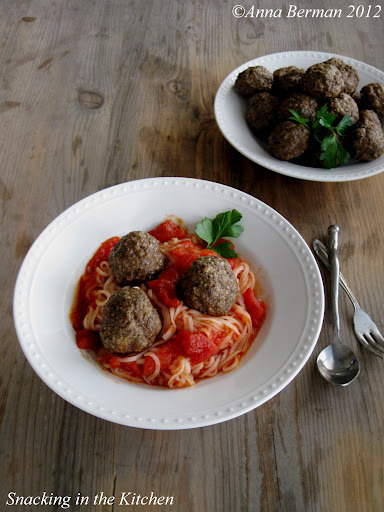 Serve meatballs, garnished with parsley or basil, along with tomato sauce and cooked rice noodles. Remember, this is a very basic recipe. 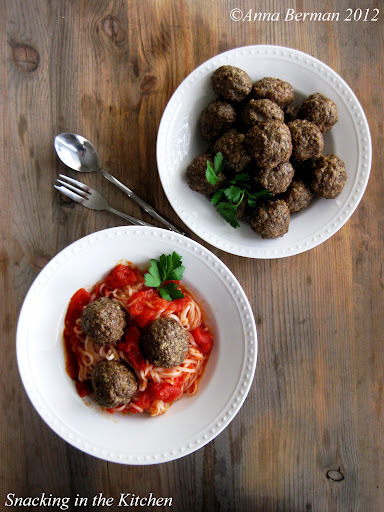 Once in your kitchen, feel free to flavor these meatballs with a variety of spices and herbs. 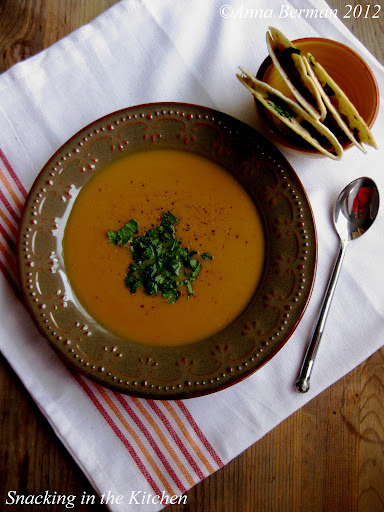 Leave Italy and travel to Turkey or Morocco, using cumin, turmeric, and perhaps even cinnamon. Thanks for reading! 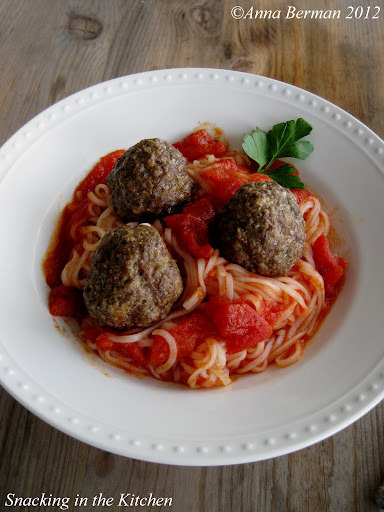 Let me know if you make these Gluten Free, Dairy Free Baked Italian Beef Meatballs with Rice Pasta and Tomato Sauce. Check out the rest of the “You Buy, I Cook” projects.